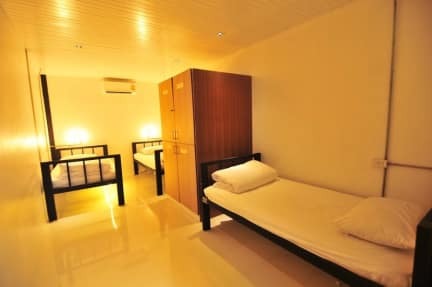 Freedom Hostels@Phi Phi i Koh Phi Phi, Thailand : Boka nu! Modern but need to improve cleaning. Its a aprox 10min walk to the partybeach but has everything you need nearby as beach, restaurants, marts etc. Bad service here, the staff cleaned away some belongings that I left on my bed and didn't even apologize or compensate. Reception is only staffed from like 8.30 AM to 8 PM so the whole hostel experience felt really overpriced to me. Good location though, away from the main party beach but still close to everything. Good hostel to stay in if you want some properly sleep in comfortable beds, otherwise no. No atmosphere at all, and the staff aren't really helpful.